This cute little hat is knit in the round for a quick result (no seams)! Because the ribbed band is very elastic, this hat will fit from age 8 to a medium size adult. I used Cleckheaton Country but you can substitute any 100% wool that knits to gauge. Aubergine (colour 2160), Brick Red (colour 2178) and Pink (colour 1840), approximately 5 grams each. Using white and 3.25mm needles, cast on 120 sts and join. Mark the beginning of the round (I like to use a small piece of contrast coloured wool as a marker). Knitting in rounds, work 10cm knit 1, purl 1 rib. Change to 4mm needles and knit 2 rounds in white. Beginning at the bottom right hand square of the chart, knit the fairisle band over the next 15 rounds. (Each square represents one stitch in the corresponding colour). Change back to white and knit every round until your work measures 17.5cm from the cast on edge. Continue decreasing in this manner until you have 96 stitches, then decrease every round until 6sts remain. Cut your yarn and thread it through the remaining stitches. Pull tight and darn in the end on the wrong side of your work. Darn in all loose ends neatly on the wrong side of your work and press according to the care instructions on your yarn band. 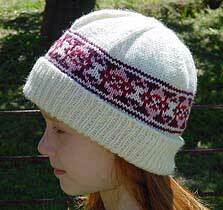 Tip: This hat can also be knit in plain stripes, or in a single colour. Make one to match all your favourite winter outfits!